A searchable library of over 200 biblical teachings on spiritual growth, effective churches, inner healing and common lectionary readings. Can we really believe the Good News of Reconciliation? What does the Good News of Reconciliation mean? How do we apply the Good News in this Church? 1. Can we really believe the Good News of Easter? The Good News of Easter is that God raised Jesus from physical death to authenticate all Jesus teachings and to create a new way for individuals to be forgiven and reconciled to God. Forgiveness removes the sin guilt that separates us from God, creates a holy place in us for the Holy Spirit and enables our soul to live on with God after our body dies. Many people have trouble with the miraculous and tend to dismiss the Resurrection – and its’ implications for salvation as myth. How do we know this is not a myth? We all hunger for forgiveness and a right relationship with God and our neighbour that gives meaning and purpose to our lives. The good news of Christianity is that Jesus sacrificial death on the Cross created a new way to forgiveness and freedom from the guilt and shame that burdens our lives and separates us from right relationship with God and others. Anglican worship includes a general confession which we can use to ask for forgiveness - but sometimes it is hard to quickly identify our sins. Our sixth Epiphany moment is discovering that Jesus was promising life after death to those who trust in him. This is a new idea - especially for Christians who think they can earn their way into heaven by good behaviour, going to the right church or knowing the right doctrine. Isaiah describes those who trust in man as “cursed” as opposed to those who trust in God as “Blessed” (17.7). The Luke reading is Jesus’ deeper teaching on how things are different in the spiritual Kingdom of God where the poor are blessed and the rich may be condemned and excluded. The question is the priorities of our heart or soul. 1. Jeremiah says “the heart is deceitful above all things” (17.9). Many people deceive themselves into thinking that because they live a good life that is enough. I am now working on an ibooks version for Apple fans which should be available as soon as the US Government re-opens and I can setup on ibooks. The ebook is $9.99 US on Amazon or from me. Signed paper copies are also available from me for $ 20.00 which includes shipping. This is a non-profit ministry so copies are available to pastors and Bible Study groups based on ability to pay. The identity of Jesus is the most important issue for Christians. Everyone agrees Jesus was a real historical person. What they do not agree on is whether or not He was the divine son of God, the promised Messiah. Many people who think they are Christians, have not had this Epiphany moment - and have not discovered their spiritual identity. Tonight we can just relax, chill out and rest from the stress of shopping for presents. We can all rest in the presence of Jesus. Christmas is the hinge of human history because God intervened by coming to us in the form of His son Jesus born of the woman Mary. The Good News is that Jesus life, sacrificial death and resurrection brought us out of error into truth, out of sin into a right relationship with God and out of death into eternal spiritual life. God gave a dramatic sign of His love for us, in trusting His son’s life to a poor unwed mother living in an occupied country. Anglican priest with 25 years experience in parish development, spiritual direction and healing ministry. 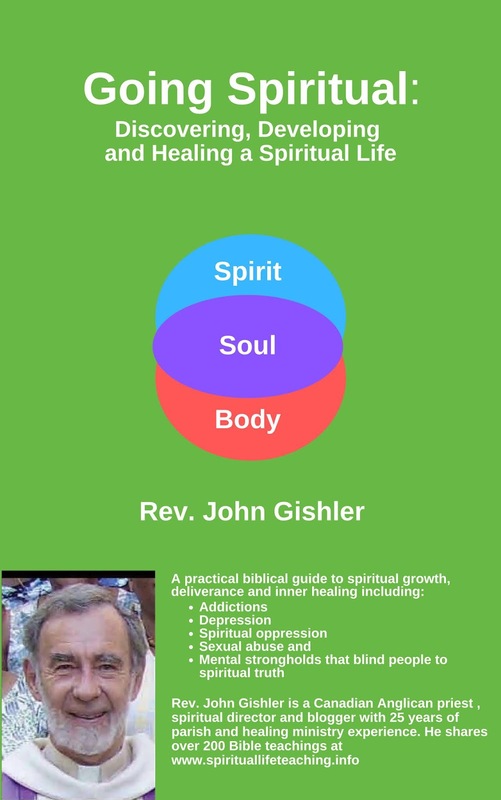 His new spiritual autobiography "Going Spiritual: Discovering, Developing and Healing a Spiritual Life" is helping many people go deeper in their spiritual lives and learn about healing prayer ministry. (available from author, bookstores and Amazon.) He is a popular speaker and workshop leader and has helped over a dozen churches find a new vision and direction. Fr. John has also worked as a teacher in Kenya and as a professional Librarian and Records Management consultant. Rev. John Gishler. Simple theme. Theme images by AndrzejStajer. Powered by Blogger.